Mitsubishi Motors Philippines Corporation (MMPC) is pleased to announce the commencement of the local production of the Mirage G4 in its 21-hectare plant located in Sta. Rosa City, Laguna. The Mirage G4 is the first vehicle that is manufactured locally under the Philippine government’s Comprehensive Automotive Resurgence Strategy (CARS) Program. 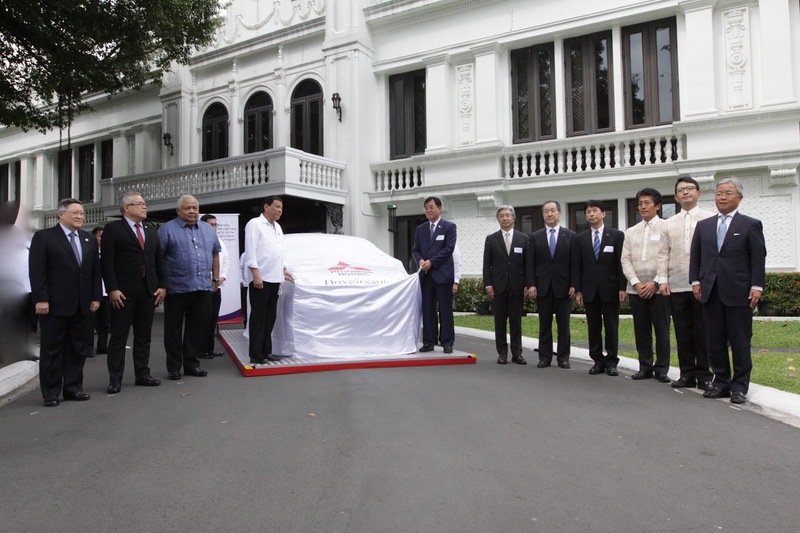 MMPC was granted the opportunity to present the first Philippine made Mirage G4 to President Rodrigo Roa Duterte in a ceremony held today at the Malacañan Palace. Heading the presentation were Mitsubishi Motors Corporation (MMC) President, CEO, Mr. Osamu Masuko, Sojitz Corporation Vice Chairman Mr. Shigeki Dantani, and MMPC President and CEO Mr. Yoshiaki Kato. 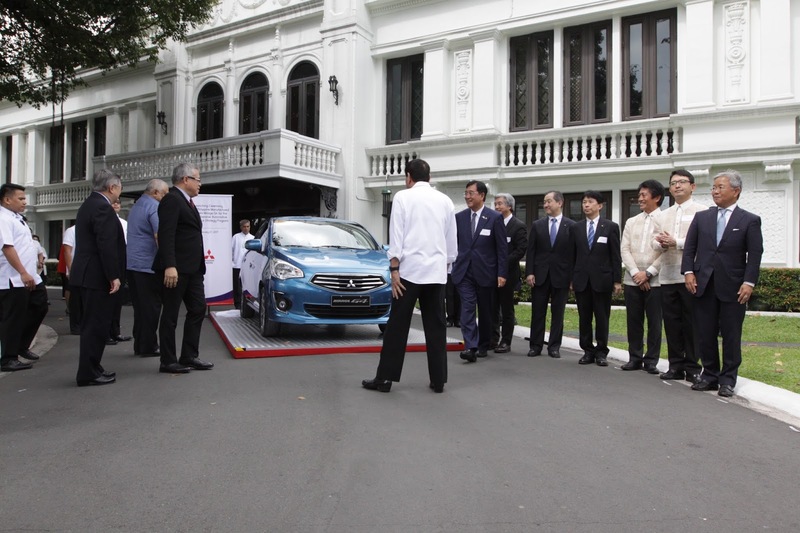 The ceremony was well attended by government officials, diplomats and executives as this occasion marks a significant milestone not only to Mitsubishi Motors but as well as to the local automotive industry and to the Philippine economy. Witnessing this milestone were honorable Executive Secretary Salvador C. Medialdea, Department of Trade and Industry (DTI) Secretary Ramon M. Lopez, Department of Finance Secretary Carlos G. Dominguez III, DTI Undersecretary Ceferino S. Rodolfo, DTI Assistant Secretary Rafaelita M. Aldaba, Philippine Economic Zone Authority Director General Charito B. Plaza, CARS Program Director, Romulo Manlapig, Deputy Chief of Mission of Japan Embassy, Atsushi Ueno, MMPC’s executives and business partners. The local production of the Mirage entails additional job opportunities to both MMPC and local parts suppliers. Some of the local parts suppliers will also take advantage of technology transfer from their foreign partners for the overall improvement in operations, efficiency and quality. With the start of the production of the Mirage G4 and the Mirage hatchback in May, MMPC aims to manufacture 20,000 units at the end of the year. The new stamping plant is also set to start operation in January 2018 which is expected to even increase further local content and boost production volume of MMPC by 50%. With MMC’s sincere commitment and trust to the Philippine government and on the CARS program, MMC has already invested 4.3 billion pesos for the production facilities and equipment required for the localization of the Mirage models. In his message, Mr. Osamu Masuko expressed his confidence to the administration of President Rodrigo Duterte, “under the strong leadership of His Excellency President Duterte, there is big potential of economic growth in this country”. He also added that the automotive industry with its broad base, high quality labor force and strong support through the government’s development policy, will contribute more to the progress of the Philippine economy. The localization of the Mirage models will further enhance MMPC’s performance with the robust demand for these passenger cars. MMPC aims to fully contribute to the steadfast growth of the automotive industry and the Philippine economy.